은밀한 안방에서나 입을법한 실크슬립 위에 스포티한 나일론 재킷을 걸쳤다. 랙앤본은 다양한 믹스앤매치로 온갖 상상을 불러일으켰다. 디자이너 데이비드 네빌(David Neville)과 마커스 웨인라이트(Marcus Wainwright)는 하이테크 패브릭과 부드러운 란제리 소재를 조합해 흥미로운 움직임을 보여주었으며, 특히 컬러 조합은 기대 이상이었다. ‘70년대가 90년대를 만났을 때’라는 느낌을 살려, 겨자색과 강렬한 오렌지색이 밝은 남색이나 광택 나는 검은색과 함께 쓰였다. 이 컬렉션에 힘을 실어준 것은 형식에 얽매이지 않은 태도였다. 부드러운 실내복을 거친 아우터와 함께 걸치던, 아니면 그저 캐주얼하고 모던하게 레이어드 했던 간에 랙앤본 쇼는 섹시한 감동을 안겨주었다. 랙앤본 쇼를 보면서 나는 90년대가 생각났고 힙합세대의 나일론 보머자켓과 믹스된 존 갈리아노의 언드레스(undress) 룩을 떠올렸다. 그렇게 해서 쿨한 믹스앤매치가 탄생한 것이다. 타미 힐피거가 서른이 되었다. 아니, 타미 힐피거가 이끄는 스포츠웨어 회사가 30주년이 되었다. 30주년 축하는 성대히 치러졌다. 파크 애비뉴 아모리에서는 미식축구 스타디움 같은 무대가 꾸며졌다. 그리고 이곳에서 타미 힐피거는 박수갈채를 받으며 무대 위를 달렸고, 아들 리키와 그의 파트너 리타 오라를 포옹했다. 이 심플한 타미 힐피거의 옷들을 이해하기 위해 스포츠 팬일 필요는 없겠다. 힐피거의 대표작인 주름치마에 귀여운 스쿨 걸 룩과 함께, 가죽 튜닉 그리고 스타디움의 인조잔디에 대비되는 수많은 컬러도 만날 수 있으니까. 즉, 축구 팬들이 두르는 흔한 스카프가 아닌 1970년대 풍의 와인색과 오렌지색, 그리고 더 다양한 스트라이프가 등장했다는 의미이다. 그 결과는? 무톤 재킷으로 재해석된 야구점퍼와 축구화 느낌의 레이스업 부츠 같은 잔 재미가 들어간 활기찬 쇼가 되었다. 그러나 30년 간 타미 힐피거를 끌고 온 결과가 이게 다인가? 잔디 밭 위에서 벌여진 모델들의 고군분투는 너무나 익숙해 져버린 쇼를 보완할 수는 없었다. 그래, 브랜드 매니지먼트를 위한 깔끔한 연습이었다 치자. 그러나 진짜로 최고는 아니었다. 우선, 더 로우의 쇼에서는 창문을 통해 서늘한 푸른 색의 하늘과 맨하튼의 경관이 뚜렷하게 내려다보였다. 그러고는 의상들이 등장했다. 유선형으로 단정하게 떨어지는 라인은 몸을 조이는 일 없이 매무새를 만들어냈다. 모던함이란 정의 내리기 쉽지 않은 개념이다. 그러나 더 로우와 이를 이끄는 자매 애슐리와 매리 케이트는 그 어려운 모던함에 거의 근접했다. 예쁜 표정을 지은 모델들은 자연스러운 우아함이 감도는 분위기 속에서 클러치를 가슴 가까이로 바짝 쥐거나 오버사이즈 스웨터를 입고 나타났다. 또 다른 키워드는 “존중”이었다. 슬릿 스커트나 깊게 파인 목선에서도 전혀 음란함이 묻어나지 않았다. 더 로우의 디자이너가 지난 해 에르메스로 떠난 후, 어쩌면 새로운 컬렉션은 실망스러울 수도 있었을 것이다. 그러나 이 고급스러운 쇼는 그 반대의 모습을 보여주었다. “전 언제나 여성에게 자율성을 주고 싶었어요.” 기하학적 구조를 없애기 위해 이곳 저곳에 드레이프를 드리운, 여성의 곡선을 추구하는 건축학적 컬렉션을 선보인 도나 카란이 말했다. 또한 도나 카란은 고인이 된 센트럴 세인트 마틴의 패션디자인 교수였던 故 루이스 윌슨에 대해 존경을 담아 이야기했다. 도나 카란은 금요일에 런던에서 열릴 윌슨 교수의 추모행사에 참석할 예정이다. 루이스는 1997년부터 2002년 사이에 도나 카란과 함께 일했고 브랜드의 정신을 정의할 수 있도록 도와줬었다. 2015년 가을 컬렉션의 주제는 “힘과 시”였다. 그리고 이는 딱 떨어지는 테일러링과 부드러운 패브릭 간의 점잖은 대결을 잘 설명하고 있었다. 뉴욕의 밤을 배경으로 옷들은 유선형으로 잘 빠졌고 다채로운 질감이 쓰였으며 때로는 허리 부근에서 부드러운 드레이프를 이루기도 했다. 가장 중점이 된 부분은 패브릭으로, 퍼 또는 섬세한 짜임이 이 쇼의 기반이라 할 수 있는 테일러링을 유연하게 만들었다. 슬리크 룩(Sleek look, 매끄럽고 윤이 나는 소재를 사용한 스타일)은 쉬폰으로 살짝 가린 다리와 같은, 좀더 가벼운 이브닝 웨어로 변신했다. 그리고 이 도나 카란 쇼는, 이전에 방황하던 모습에서 벗어나 목적을 지니고 정확히 나아가는 것으로 보였다. 톰 브라운 컬렉션의 강렬하고 화려한 어둠을 들여다봤을 때에야 나는 2015년 F/W 뉴욕패션위크에서 검은 색이 거의 눈에 띄지 않았었음을 깨달았다. 가장 선호된 1970년대 오렌지색을 위시해 각종 컬러들이 시즌을 이끄는 동안 톰 브라운이 거둔 성공은 주목할만하다. 그의 여성복은 당연하게도 미망인의 검은 옷차림을 추구하고 있었다. 얼굴은 베일로 가린 채 모자는 날쎈 모양이었고 옷들은 완벽한 라인을 선보였다. 처음엔 의학적 시나리오에 따라 빙글빙글 돌아가는 나무 펜들로 만들어진 무대에는 하얀 의상을 입은 두 의료인이 누가 봐도 환자를 돌보는 모습으로 등장했고, 그 뒤에는 여성들이 줄지어 들어와 경의를 표했다. 무대는 곧 화려하고 정교한 장식의 검은 ‘애도’의상을 입은 문병객들이 등장하면서 바뀌긴 했지만, 이 ‘병원’씬은 브라운에게 친숙한 관심사로 보였다. “전 로맨틱한 컬렉션을 만들고 싶었습니다. 그리고 색을 한가지만 쓰자니, 명암을 주기 위해서는 다양한 재질을 활용할 필요가 있었죠.” 견고한 프레임 안에서 다채로운 장식을 선보이는 이 디자이너가 말했다. 깎은 양털을 두른 코트의 칼라와 커프스, 아니면 목에 두른 쉬폰과 넥타이가 바로 그 예였다. 브라운은 음울한 창의력을 최대한으로 발휘했고, 빅토리아 풍의 우아한 의상에 들어간 디테일에 강하게 주목했다. 그리고 나에겐 이러한 의문이 생겼다. 비유적뿐만 아니라 문자 그대로, 왜 그리 많은 컬렉션들이 경박해 보이는 것인가? “파도를 만드는 거였죠.” 캐롤리나 헤레라는 물의 움직임이 옷의 언어로 탈바꿈한 우아하고 세련된 쇼가 끝난 후 백스테이지에서 이렇게 말했다. 바다의 소용돌이나 파도의 형태를 한 패턴에는, 긴 드레스에 쓰였건 아니면 단순히 일상복에서 쓰였건 간에 넋을 나가게 하는 매력이 있었다. 어떠한 패턴은 물에 비친 한줄기 빛과 같다면, 어떤 패턴은 가느다란 하얀 선으로 부서져가는 파도와 같다. 캐롤리나의 스타일은 언제나 클래식한 화려함이 있고, 시즌마다 그다지 크게 변하지는 않았다. 그러나 2015 겨울시즌의 의상들은 휘몰아치는 바다를 분사기술이나 사진인쇄를 통해 표현했다. 강렬한 포인트 컬러와 함께 크림색과 검은색, 그리고 흰색 간의 밸런스가 잘 맞아 들어갔다. 헤레라는 세련된 스타일을 만들어내는 데에 특출하고, 디지털적인 실험과 함께 모던함을 추구하는 데에도 훌륭하다. 이번 쇼가 좀더 치밀하게 편집되었으면 좋았겠지만, 플랫슈즈와 21세기형 프린트 덕에 충분히 엣지 있고 모던했다. A silken slip as if from a boudoir worn with a sporty nylon jacket – all sorts of intrigue could be imagined with the eclectic combinations at Rag & Bone. Mixing high-tech fabrics with soft lingerie material was an intriguing move from designers David Neville and Marcus Wainwright, especially as the colour combinations were also unexpected. With a nod to a Seventies-meets-Nineties look, mustard and full-on orange were melded with bright navy or shiny black. It was the casual attitude that gave this collection its energy. Whether the concept was bringing together soft indoor pieces with harder outerwear, or just a casual, modern way of layering, the Rag & Bone show had a sexual charge. I was reminded of the Nineties, and John Galliano’s celebration of undress, mixed with the nylon bombers of the hip-hop generation. It made for a cool combo. Tommy Hilfiger turned 30 – or at least his sportswear company did. The celebration called for a big gesture – something the size of a football stadium laid out in the Park Avenue Armory. This is where Tommy himself ran a lap of applause before embracing his son Ricky, and his son’s partner, Rita Ora. 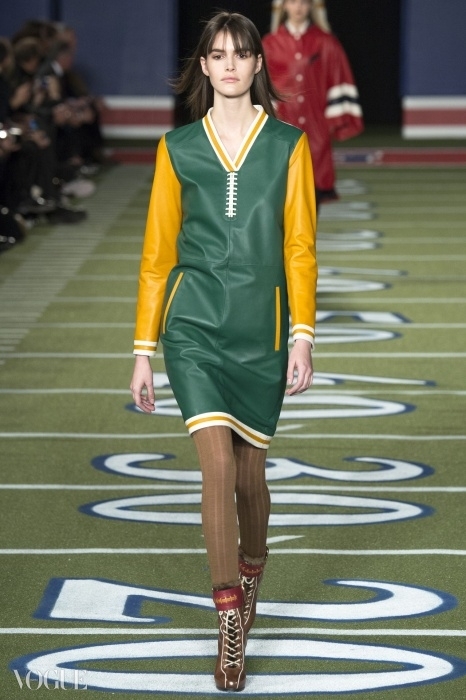 You did not need to be a devotee of sport to understand the simple clothes – as ever with Hilfiger’s cute schoolgirl look of pleated skirts, leather tunics and any colour that stood out against the stadium’s artificial grass. That meant shades of wine and orange (a hint of the 1970s) and more stripes than you would find on the scarves of football supporters. The result? 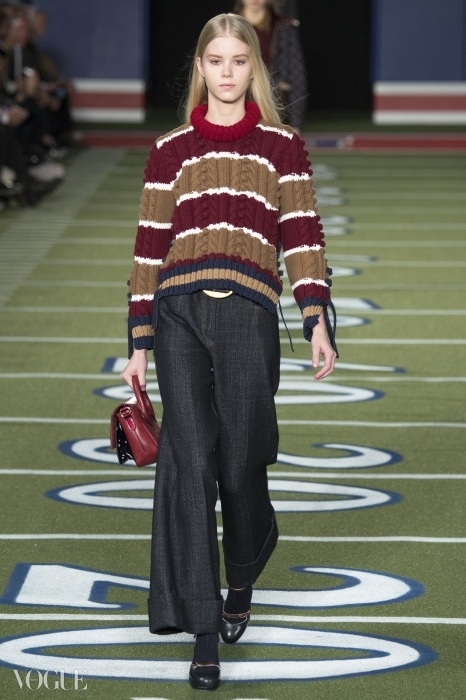 A lively show – with a few mild surprises, such as a shearling baseball top and boots laced up, football style. But was that really it for 30 years at the helm? All the frolics on the turf could not make up for a show that seemed very familiar. Let’s call it a neat exercise in brand management – but not really a winner. First there was the clear view through the windows, looking over an ice-blue sky and the Manhattan cityscape. Then came the clothes – streamlined, but in a gentle way, so that they were shaped to the body without constricting it. A typical item might be a white suit, the skirt falling gently to mid-calf, a loose cape of a coat, and the flat slippers that were a significant part of this decent and woman-friendly look. Modernity is so tough to define, but The Row, and the sisters behind the label – Ashley and Mary-Kate – come close to it: models with sweet faces and an air of natural elegance, as they cuddle into an oversized wool sweater or clutch a bag close to the chest. The other key word is ‘respect’. Not even a hint of vulgarity suggested by a slit skirt or a plunging neckline. After The Row’s designer departed for Hermès last year, the new collection might have been a disappointment. But the opposite was true of this fine show. “I have always wanted to empower women,” said Donna Karan of her architectural collection, which followed the female bodyline – with a drape here and there to break the geometry. The designer also spoke admiringly of Louise Wilson, the late professor of fashion design at Central Saint Martins, whose memorial she will attend in London on Friday. Louise worked at Donna Karan from 1997-2002, and helped define the spirit of the brand. “Power and Poetry” was the title of the Autumn 2015 collection, and it explained the gentle face-off between strict tailoring and soft fabrics. Against the backdrop of New York at night, the clothes were streamlined, rich in texture, often with a softening drape at the waist. 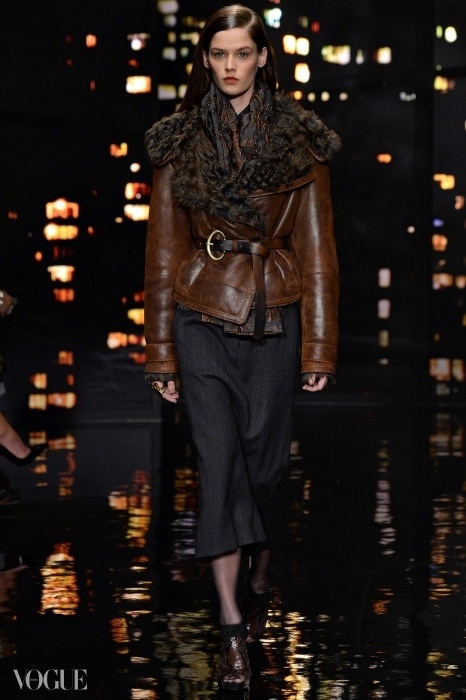 Fabric was key, with fur or an artisinal weave softening the tailoring that was the show’s bedrock. 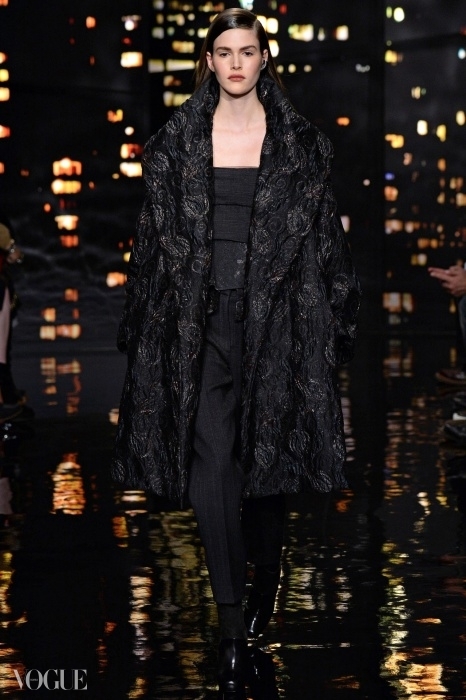 The sleek look broke into a gentler evening style, with legs lightly veiled in chiffon. 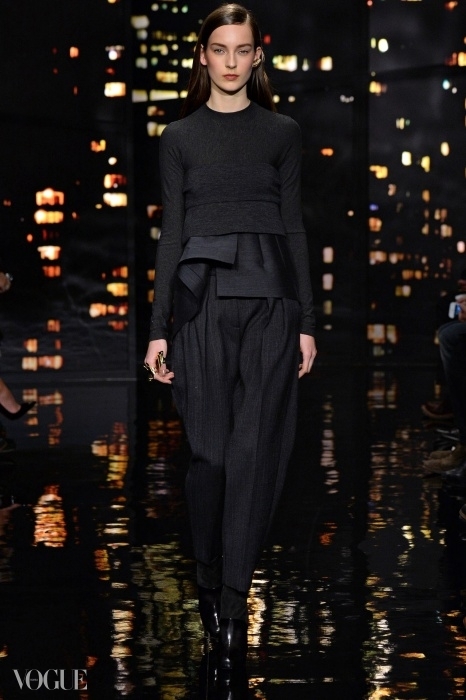 And this Donna Karan show seemed purposeful and to the point, while previously the brand had meandered. Only when I looked into the intense, decorative darkness of Thom Browne’s collection, did I realise how relatively little black we have seen at New York Fall/Winter 2015. 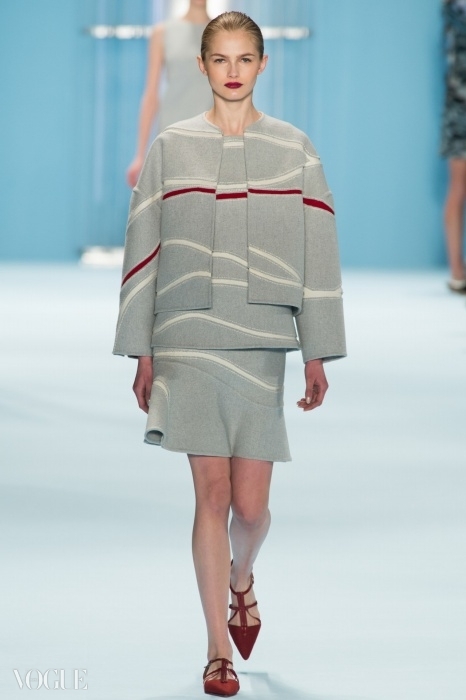 With colour – especially the favoured 1970s orange – brightening up the season, Thom Browne’s success was remarkable. His women were, of course, dying for the black widow look: faces veiled, a hat whooshed up like a sailboat, the clothes tailored to perfection. In what was initially a medical scenario, the set built of circular wooden pens featured two white-clad hospital figures apparently ministering to a sick patient, while a parade of women paid homage. This ‘hospital’ scene seemed a familiar focus for Browne, though he soon switched to the hospital visitors, whose black ‘mourning’ clothes were densely decorated and often elaborate. “I wanted it to be romantic – and with the one colour, it needed so much texture to give it light,” said the designer, whose varieties of embellishment within a firm framework were powerful. Two examples were a coat’s shearling collar and cuffs, or chiffon and a tie at the neck. The intense attention to detail on graceful clothes with a Victorian feel showed Browne at his darkly imaginative best. And it also raised the question: why do so many collections seem literally as well as metaphorically lightweight? “Making waves” said Carolina Herrera backstage after a graceful and refined show where the movement of water was translated into the language of clothes. There was something mesmerising about patterns of sea swell and waves, whether they appeared in swooshes on a long gown or simply on daywear. One would have the effect of light on water, the other a wave reduced to a thin white line.